No workshop is complete without a trusty and reliable workbench to see you through project after project. Of course, not everyone is going want or need the same kind of workbench. If you have a smaller garage, then you will probably do better with a taller workbench that may not be quite as long or deep. Aside from your workspace, there are a lot of different things that make one workbench better than another. It can be hard to tell which qualities are more important ahead of time. Is it more important that your workbench provide plenty of storage, be able to hold heavy workpieces, or be more easily transported? The answers to these questions will help you narrow down your search. To help you further, we have put together a list of the 5 best garage workbenches and highlighted what each one does best. Then we provide a helpful buyer’s guide, so you can find the best garage workbench for your needs. Seville Classics is a company with nearly 40 years of experience. While the company started as a workshop storage company, they have expanded into general storage needs. This means the company has something for everyone without losing sight of their focus. As such, the Seville Classics is not only our best pegboard garage workbench, but it is the best all-in-one for a smaller space. The Seville Classics is a bit more compact than some of the other models but still has a lot to offer. 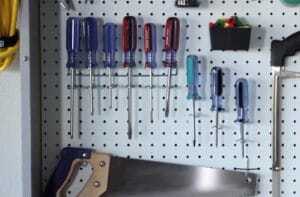 For one, the addition of a pegboard means you do not have to put tools in a drawer where they get mixed up. Instead, you can simply hang your tools on hooks on the board. Of course, there is a sliding drawer which uses a smooth, ball-bearing construction. The drawer is also lined with rubber to prevent tools and hardware from sliding around. This Seville Classics may not be the biggest garage workbench we saw, but it is fairly well-made. The frame of the workbench is made of powder-coated stainless steel. This provides plenty of strength while also protecting against rust and corrosion. The table of this workbench is made of hardwood, though it may need to be releveled and finished. Finally, the self-leveling feet make sure that every space is a level space. We end our list with another Seville Classics, this time meant for a larger space. In terms of a general workbench for the garage, we reviewed none better. 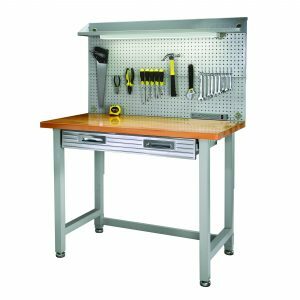 This workbench is made out of solid materials, features extensive storage options, and is even in general convenient. All of these things combined with one of the largest workspaces makes this an easy choice for our Editor’s Choice best garage workbench. If you need a workbench that can also house plenty of tools, components, and hardware, the Seville Classics has you covered. First, there are 12 drawers total of different sizes. On top of that, each drawer is lined with rubber to prevent sliding. 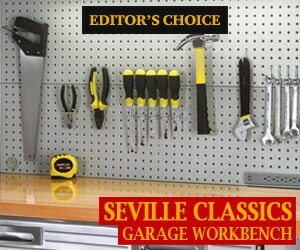 The Seville Classics also has a large cabinet for bigger items and the sides are made of pegboards. Just keep track of the total stored weight since it only has a weight capacity of 500 lbs. Though the weight capacity may not be that impressive, the materials and construction still are. The frame is made of stainless steel with the table made of hardwood. The cabinet can also be locked with an included key. This workbench is also mounted on 5” solid rubber wheels. This allows you to move the workbench if necessary, but the locks prevent accidental movement. The workbench has 2 handles to assist in moving it. 2x4basics is actually a brand of the Hopkins Manufacturing Corporation. 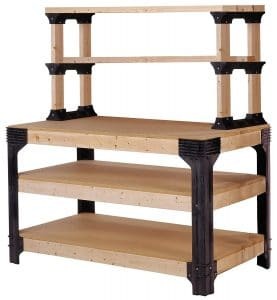 This brand specializes exclusively in selling the frame of various types of storage solutions. While this includes garage storage and workbenches, it expands well-beyond that niche. However, all 2x4basics have one thing in common: they do not come with the actual surface outside the frame. This adds a bit more work and cost but makes for the best custom garage workbench. Whether you are looking for a large table or a lot of storage, the 2x4basics can accommodate any need. Since you are only provided the frame, you can decide how big you want your workbench. The 2x4basics is designed to work with any normal 2×4 cut from any kind of wood. Even better, you only need 90-degree cuts for all of the joints. This means you do not need any miter or bevel cuts. Even though you are only buying the frame, the 2x4basics still presents great value. With only the cost of the 2×4 planks and your time, you can have an 84 x 48” table. This would be easily the largest table on our list and it would also have the second-best weight capacity of 1000 lbs. All of this is provided by the least expensive product on our list. 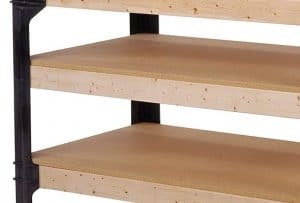 Just remember to purchase shelves and get better hardware and fasteners than those provided. WORX is known more for their power tools than their storage products, but this is not your standard workbench. 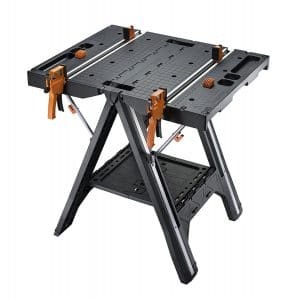 In fact, the WORX Pegasus is better understood as a sawhorse/workbench hybrid.While this may provide some added versatility, the WORX Pegasus serves as a better sawhorse than workbench. Still, it does easily serve as the best portable garage workbench we saw. While a couple workbenches on our list are marginally portable, the WORX Pegasus is easy to transport. This is the only workbench we reviewed that is made of plastic. While this does place some limits on the weight capacity, it means the WORX Pegasus is by far the lightest workbench we saw. Even better, the WORX Pegasus also has a design which can fold up for easy carrying. The legs also feature a locking mechanism to make sure they do not accidentally fold while in use. Being easy to move does not help the WORX Pegasus if it is not any good once you get there. Depending on what you need to do, the WORX Pegasus may not be able to accommodate you. The actual “workbench” function is the weakest on our list with a weight capacity of only 300 lbs. The sawhorse function has no such issues and sports an impressive 1000 lb weight capacity. The workbench “table” also has 2 subpar, built-in clamps and 4 sets of dowel dogs. BenchPro is not a well-known company, but it has been around for 35 years and specializes exclusively on benches, chairs, and carts. Rather than aiming for the average person, BenchPro sells mostly to businesses. This makes some of the design choices of the Roosevelt economic rather than quality-based. Still, as a workbench meant for professionals, the Roosevelt is still the best weight capacity garage workbench on our list. Since BenchPro makes their products mostly for businesses, they have to last a while. To ensure their customers are happy, BenchPro offers a 10-year warranty pretty much across the board. When you consider that the frame is made of steel and the table 1 ⅛” thick, this seems like a solid value. Of course, you can actually increase the Roosevelt’s durability by replacing the table altogether. While this will void the warranty, the table provided is made of particle board. While the Roosevelt is not “custom” like some other models, it still has plenty of upgrades. In fact, you can add a pegboard, a fluorescent light, and more. The only problem is that this will increase the cost of an already more expensive workbench. The ability to easily replace the table is nice as well, and the workbench itself is easily adjusted. You also might need some additions as it comes with no storage beyond the table. Since a workbench deals with numerous tools and supplies, you need to make sure it can handle all the weight and abuse. While the construction techniques will be important, the materials are more important. Of course, different materials will provide various benefits and come with their own drawbacks. Figuring out what issues you can correct or safely ignore while making sure you meet certain minimum standards is the goal here. 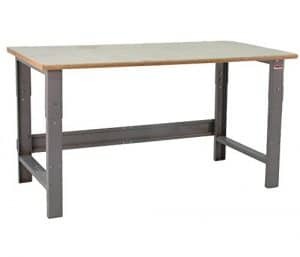 Metal – While the use of aluminum is not unheard of, most workbenches use steel. It is incredibly strong and can last decades if properly maintained. In fact, a powder-coated stainless steel frame kept out of the weather can last longer than the walls around it. That caveat about the weather is arguably steel’s biggest problem. With wood, you can generally seal it to prevent the wood from absorbing water and bloating. While powder coats help with corrosion, they are not nearly as reliable for metal as sealers are for wood. This means that exposed workbenches will always eventually have to worry about rust and corrosion. Aside from being strong, steel is also not too heavy. Of course, it is still generally the heaviest material used for workbenches. But steel frames can still easily be moved from one place to another if put on wheels. This reduces the potential problem of portability–so long as you do not need to go up or down a flight of stairs. Another great thing about steel is that it has plenty of give. It might not seem like it from our perspective, but steel bends more than you might think. This allows it to absorb the weight above it without snapping. Even when pushed too far, the metal will bend and may still be functional. Wood – Wood is often seen as a good middle ground, but it is really more of an aesthetic choice. Unless you use high-quality hardwood, there are technically better materials available. Of course, many people just like the look and feel of real wood. There is something classic and solid about a hardwood workbench. In terms of functional purposes, wood can be incredibly hard while still offering plenty of flexibility. Unlike metal though, when wood is pushed too far, it will snap and splinter. This makes damaged wood weaker than damaged metal, all other things being equal. One advantage of wood is that you can more easily change its exterior. Because wood is porous, you can seal and protect the wood with a wide variety of finishers. Not only does this allow you to customize the look of your workbench, but it provides better protection from the elements than powder-coating does. With weight, good hardwood is not that light, but it is not terribly heavy either. That said, an assembled hardwood workbench is still difficult to move around. Wheels can help make portability better, but like with metal, stairs still present a challenge. MDF – This is definitely a lower-grade material, but it can be used to save some money for specific setups. Basically, if you have a climate-controlled workshop, there is nothing wrong with a workbench made of MDF. Of course, if the workspace is not as controlled, the MDF workbench has a much shorter lifespan. The problem is that despite its appearance, you cannot seal MDF the same way you can wood. Because of the way it is made, moisture will eventually work its way into the MDF. When this happens, the water will eventually warp the MDF material. 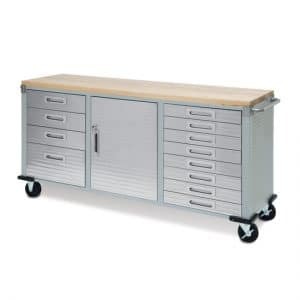 This means MDF workbenches in your average garage have a short lifespan. MDF does not provide much in the way of strength either–at least, not compared to metal or wood. If you are a serious craftsman, then MDF will simply not satisfy your needs. If you are an occasional hobbyist, MDF will probably work just fine and save you some money. Plastic – Plastic is likely seen as the worst material to use. This is because plastic is not significantly stronger than MDF. Part of it also has to do with the fact that small plastic components almost always fail. But plastic used for workbenches does not have to follow that mold. Basically, plastic is different from the other materials in how it acts. This makes it really good for a very specific purpose. But if you try to use it outside of that purpose, it will probably break–sooner rather than later. As a workbench, plastic is best for small to medium-sized projects. If you try to use a plastic workbench for a big project, there is a good chance the plastic will fail. However, if you only use the plastic workbench for medium-sized projects and smaller, it could last far longer than the cost was worth. In this way, it is up to you to use your plastic workbench responsibly if you want it to last. Despite its relatively weak strength, plastic is impervious to water. This means you can leave a plastic workbench outside without having to worry about the water corroding or warping it. Plastic is also resistant or non-reactive with many of the chemicals used on different projects–especially with wood materials. Weight capacity is ultimately a complicated matter determined by numerous qualities. The materials, the manufacturing, and the construction all affect weight capacity. 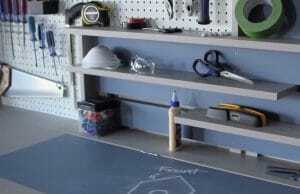 But the maximum weight capacity will still impact how you can use your workbench. Along with the size of the table, the weight capacity will affect the maximum size of your projects more than anything else. Most of the time this is not that big of a deal, but people often forget to include the weight of the tools and materials stored. This means a workbench with a 500 lb weight capacity that is holding 200 lbs worth of tools can only support 300 lbs of workpieces. This usually is not a problem for hobbyists or DIYers but can limit master craftsmen. If you work on especially dense projects, especially something mechanical, you will want to make sure you have a large weight capacity. A larger weight capacity also means the workbench can handle lower weights for longer without wear and tear. This is the top part of the workbench and will largely determine what kind of projects you can work on with the bench. If the bench is too small, you will not be able to work on larger projects. 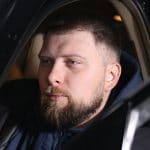 This can also be an issue with the depth, but there are more workarounds for that problem. Some workbenches might even have optional inserts to increase the size of the table. The table can also limit your projects based on its precision. The flatter the table, the more precise work you can do. If the table is not straight, that can affect your measurements or cuts–especially for irregular pieces. This can be affected by the material used, but the manufacturing process is also important. The straightest tables are often made of wood, but a high-end metal workbench will also usually be straight. MDF and plastic tables are the least likely to be straight. Poorly manufactured metal is often not straight either. If you just need the workbench for rough work, the table’s straightness is not important. This will generally only matter if you need to take the workbench from job site to job site. Otherwise, you should probably just find a single place for your workbench. Of course, sometimes, you will still need to move workbench from time to time. In this instance, it is helpful if the workbench has wheels. Wheels allow you to easily move the workbench on a level surface. This does not help if you have to get the workbench up or downstairs, but it does make moving it within a garage or workshop easier. Just make sure the wheels have locks or that you have chocks. If you need a workbench that you can take from job to job, plastic is your best bet. Despite its poor comparison to wood and steel, plastic is still incredibly strong for its weight. This makes it an ideal material for a portable workbench. Just be sure not to overload it. 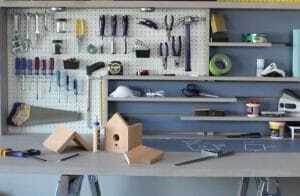 The “best” garage workbench will be different depending on what you need it for. If you plan to take your workbench from job site to job site, you will want something different than a workbench for your private workshop. That said, there is sure to be something for everyone on our list, but we think a couple really stand out. The Seville Classics UltraHD Rolling workbench is easily one of the more all-around capable workbenches that we saw with plenty of storage. The steel frame combined with the hardwood table form a formidable pair. The locking wheels also make moving this beast a little bit easier. Our other recommendation is also a Seville Classic, this time the UltraHD Lighted workbench. Much like the rolling model, the lighted UltraHD features a durable steel frame with a hardwood table. As the name implies, this model has a fluorescent light attached, but it also comes with a convenient pegboard to hang your tools from. While it is a bit more compact than some of the others, it is still reasonably priced.